Sweeping – Clean Sweep, Inc.
Clean Sweep, Inc. is proud to be Louisiana’s first and only Certified Sweeping Contractor! Our national certification is your assurance that Clean Sweep, Inc. adheres to the highest standards in the power sweeping industry. When you utilize Clean Sweep, Inc. to handle your pavement sweeping, you’ll get superior results each and every time. When it comes to sweeping highways, construction sites, and other types of heavy duty areas, you can count on Clean Sweep, Inc. Whether you have the toughest milling job or a municipal sweeping route, we can handle it. Our employees are highly trained and have the capabilities to contact our office at any time. 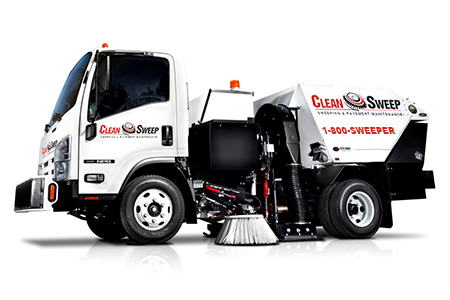 The Clean Sweep fleet includes a variety of late model, municipal-class air and broom sweepers, so you can be assured we’ll put the right machine – with the right operator – on your job each and every time. If you would like a current reference list for parking area sweeping or any of the projects we handle, give us a call or use our contact form to request one. Please let us know how we may assist you by requesting a FREE professional assessment from our management team. We’ll be glad to help you in any way we can. Clean Sweep management routinely attends our industry’s national tradeshows and keeps up with the latest in equipment, Best Management Practices (BMPs), and the many emerging environmental reasons to utilize sweeping. We invite you to take a look at our handouts on some of the topics that surround street and construction sweeping linked below. Do It Safely and Efficiently. Construction Sweeping Information. There are no specific state-mandated regulatory requirements for sweeping companies. However, because of our emphasis on quality and many years of involvement with the power sweeping industry, Clean Sweep complies with the highest standards in our national industry. Clean Sweep’s professional management team is knowledgeable about the many reasons why power sweeping is one of the most cost-effective ways that exists for keeping stormwater pollution from running off into our waterways, as well as why this same pollution – if left on parking lots, roadways and other paved surfaces – creates significant health problems.